Sparkling Beverage with 16% Fruit Juice and Mint Infusion, sugar and sweeteners. Enjoy The Citrusy taste of the Italian sunshine. 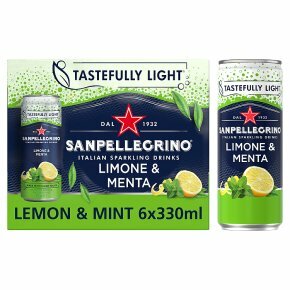 SANPELLEGRINO Limone e menta (Lemon and Mint) is made with zesty lemon juice and fragrant mint, two ingredients that make this a fresh and balanced beverage with a persistent taste its soft, sweetish, balanced flavor finishes with a pleasant citrus persistence and subtle notes of mint.